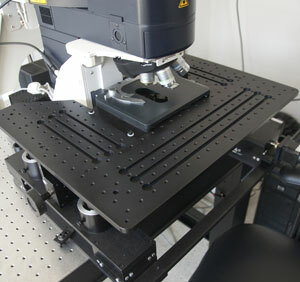 This microscope was configured to enable imaging of multiple fluorophores in a single specimen. 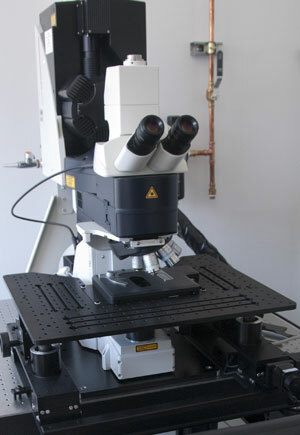 This microscope is equipped with 3 photodetectors (PMTs) for reflected light (fluorescence) and a 4th PMT for transmitted light. The reflected light PMTs are located behind a prism/mirror system that allows precise, tunable determination of the wavelengths allowed to reach each detector. This enables one to minimize overlap in emissions of different fluorophores while maximizing the detection of each. The microscope has been equipped with a specialized stage to facilitate the imaging of a number of different kinds of preparations. The stage can be lowered to provide a large working distance between the objective and stage, enabling the use (with appropriate approvals) of living tissues and even animals. Different inserts can be placed in the stage apparatus. One insert is a standard, manual x-y stage with slide holder, but other possibilities include a solid platform that would support a small animal. Expanding possibilities, the investigator can design additional inserts to accommodate a variety of dishes/chambers. Lastly, the stage has x-y motors so x-y position can be controlled from software. 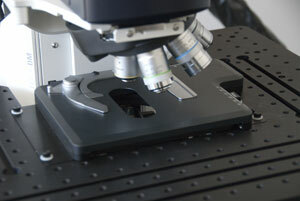 The microscope can be configured to utilize a heated CO2 chamber. 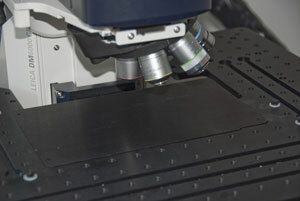 A heated stage insert for use with the microscope is available. A thermistor-controlled in-line heater for superfusion experiments is available. The microscope is equipped for standard, widefield epi-fluorescence, including filter cubes for TRITC, FITC, and DAPI, CFP, and Alexa647.